This is an ongoing series that began in 2013. It started with one hanger stitched with a British Public Service Announcement from the 1970's: "There's no need to make an abortion of it." 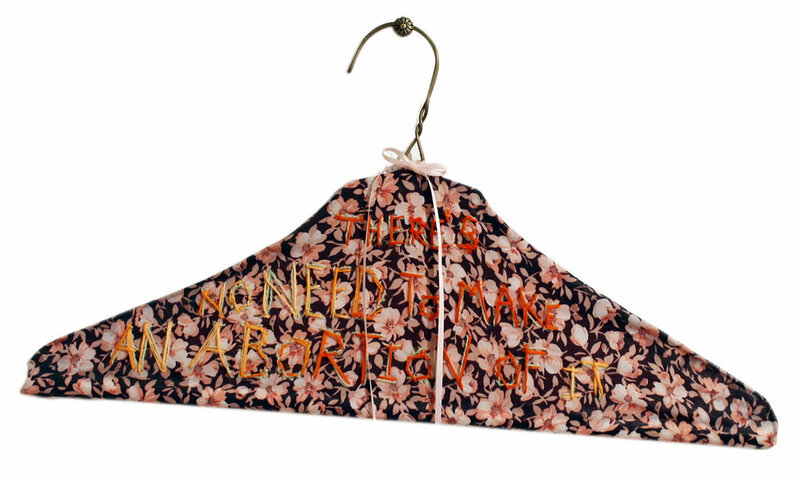 Embroidering that text on a wire hanger, which has historical significance for use in back alley abortion, addressed the ever present fear of women's rights being stripped away. After making this initial hanger, I fell in love with the format for text based work. Some continue with the theme of abortion, but others divert to funny observational quips, angered thoughts, and issues of mental health. The play of color and texture as well as the varying size of text are meant to induce a "slow read" -popular among painters.